TOTO, the popular Japanese toilet manufacturer, seeks to improve people’s quality of life. They have been in business for more than a century and have introduced numerous toilet innovations. This is evident in the quality of their products, which have been one of the market’s most impressive. Of course, their commitment to excellence is present in the TOTO Neorest. The TOTO Neorest is among TOTO’s finest products. This classy and stylish toilet will surely make a great addition to any modern bathroom. Now, let’s find out why this toilet has become highly acclaimed among many reviewers. I hope this TOTO Neorest Review can help you decide if this model is the right TOTO toilet for your bathroom. The TOTO Neorest 700H has one of my more preferred designs and will look good on almost any bathroom. It meets both the ADA and Universal Design requirements, providing ease of use to most people. In addition to that, this toilet features an elongated bowl that provides extra comfort to adult users. A feature I really like is the SoftClose toilet seat. This seat can not only prevent accidental slamming on fingers but also closing the lid is virtually noiseless. And of course, no more strong bangs that have a possibility of damaging the bowl rim. To conclude, TOTO will not have been this popular if they used sub-par materials. The TOTO Neorest is made of the finest ceramic material and will be durable and very long lasting. It is nothing short of a good investment. Other luxury features include a heated seat, a hands-free automatic flush and rinse, a cleaning water spray and a dryer. 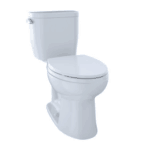 This dual flush toilet is equipped with TOTO’s patented Double Cyclone Flushing System. The ultra-high efficient system works by using its cyclone siphon jet flushing mechanism. It offers a choice of 0.8 and 1.0 gallons per flush, which is a far lower range than most toilets. Also, there is an automatic flushing feature which adds even more convenience for the user. The Toto Neorest efficiently conserves water which not only saves you money in the long term but also helps protect the environment. It features a dual flushing system for both solid and liquid waste. The low volume flush only uses 0.8 gallons per flush and the high volume flush uses 1 gallon per flush. Before 1992, without the Federal Energy Policy Act, most toilets used upwards of 7 gallons of water per flush. These days, all Toto toilets use 1.6 GPF and under, however the Toto Neorest has really set the bar high for water usage efficiency. Well, the Toto Neorest is good for the environment and your pockets, which sounds really good to me. This is why the Toto Neorest is able to acquire numerous certifications like the prestigious WaterSense. The Toto Neorest is made with the unique SanaGloss material which prevents debris and mold from sticking to ceramic surfaces. Not only this but its ewater+ technology transforms water into a safe and powerful compound, and keeps the toilet bowl clean after every flush. This keeps the bowl from accumulating germs, bacteria and stains. That means fewer chemicals and water is needed to clean this toilet which results in more savings. The final feature I would like to highlight is called the CeFiONtect. This is an extraordinarily smooth, ion-barrier surface to help keep the bowl cleaner longer. As mentioned above, the bowl style of this unit is elongated. An elongated shaped bowl distributes your weight more evenly on the toilet. This bowl shape is ideal for elderly people as well as those with disabilities or people suffering from back or knee problems. They no longer need to squat down low making it easier for them to stand up. There is no risk of waking up your entire family when flushing during the night. Not only is this flushing system very powerful and efficient, it is also very quiet. Last but not the least, refilling happens quickly too, so you will not have to wait a long time for the next flush. 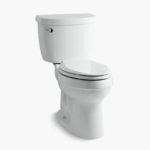 The Toto Neorest features a comfortable elongated bowl, powerful yet quiet flush and it fills up quickly also. These two toilets come with a few similar features. Both have EPA WaterSense certification, but the TOTO Neorest uses less water per flush than the Aquia Dual Flush. They both are Universal Height which is good for people of all ages and abilities, so the toilet is easy and accessible for most people. They both meet the ADA criteria. However, this is where the comparison ends. The Toto Neorest is a light years ahead in features. The Neorest is a luxury toilet and to have luxury features, such as an automatic flush, heated seat, water spray and dryer etc, then it will cost a lot more. Both are Dual Flush Toilets, however the Toto Neorest is a luxury toilet and far more expensive. Both toilets have have all of the great features that a TOTO Neorest toilet has to offer. Automated lid and flush, automatic rinsing, heated seats, warm water spray and many more. The only real difference between the two is that the Neorest 700H is ADA compliant and Universal Height certified. This means that the 700H is more accessible to all age groups and capabilities. Now both are awesome toilets, however if the Universal Height isn’t an issue then I see no reason to pay a few hundred extra dollars on the 700H. Both are very similar toilets, however the 700H is ADA compliant and Universal Height certified, where as the 550H is not. Just like the TOTO Neorest, the WoodBridge Luxury Bidet Toilet is a great one-piece toilet with an elegant design. It features self-cleaning nozzles which is the counterpart of TOTO’s Neorest’s eWater+ Technology. This ensures no mold or debris build-up on the inside of the toilet that might require extra effort to get rid of. The TOTO Neorest and the WoodBridge Luxury Bidet Toilet both have an elongated shape. The Woodbridge also features a hygenic wash spray and dryer and also a 5 temperature heat seat. Other features that you’ll appreciate is its Energy Save Mode design, safety on/off sensor and the quick release seat. If you are on a limited budget but want luxury and advanced features just like what the TOTO Neorest has to offer, the WoodBridge Luxury Bidet Toilet will be a very wise purchase. If you want a luxury toilet at a fraction of the price then this Woodbridge bidet toilet may be worth considering. 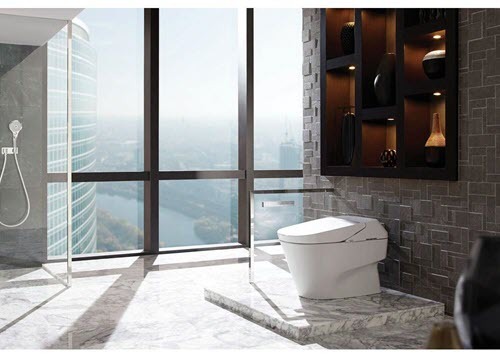 The Toto Neorest is a toilet that will add style, comfort and a lot of luxury to your bathroom. With a heated seat, automatic flush, warm water washer and dryer, this toilet is surely one of Toto's finest creations. With the contemporary yet classic look of the TOTO Neorest, it can improve your bathroom’s appearance no matter what the theme. Plus, with some of TOTO’s best technology featured in this product, it is no wonder it has become very popular with homeowners. First, the hands-free automatic flush which is convenient and hygienic. Next, the heated seat with a temperature control. This is a great feature during winter time and excellent for people suffering in the cold. Third, the Wonderwave Spray. This gentle water spray has accommodating oscillating and pulsating features. You no longer have to clean yourself for this toilet will do the cleaning for you. Then there’s the warm-air dryer that will keep you feeling refreshed. Last is the brilliant, automatic lid opening and closing. The Toto Neorest makes everything hands-free. From the lid opening, to the seat warming automatically and to cleaning you after you’ve done your business. This toilet has so many advanced features that your bathroom might end up your favorite place in your house. Hopefully, this TOTO Neorest Review will help you find the right toilet for you. If you still have any more questions, please don’t hesitate to drop it in the comment section below. I will reply as soon as possible.